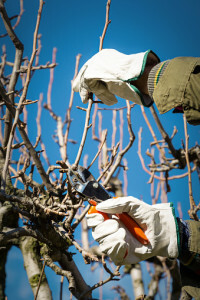 Winter Pruning: When Should I Prune? If you are green thumb, (or an aspiring green thumb!) it is important to know when to prune your plants and how to prune them. Different plants may need pruning at different times of the year, including in the winter. Why should I prune my plants? Pruning helps to shape the plant and reduce the overall size of the plant as well. This helps to remove dead or diseased wood, and thinning out the branches can help the plant stay healthy over times. Good air circulation between interior branches of certain plants (such as roses or hydrangeas) helps to prevent different types of plant diseases. Pruning in the winter, also known as dormant pruning, is very important for because wounds that are produced from pruning during the growing season can expose the trees to a bacterial diseases. Additionally, you will find that it is easier to prune your plants during the winter, because leafless structures are easier to see, resulting in better results come springtime. What should I prune in the winter? There are several different plants that are good for winter pruning. To keep your plants healthy, try to prune them before new spring growth begins, but after the threat of severe cold or frost is gone. While New England winters can be rough, this time frame usually falls between 4-6 weeks before spring. Fruit Trees: While fruit trees flower off of growth from the previous season, pruning should be done while the tree is dormant. Pruning will promote more vigorous growth and larger fruits. All trees have certain needs when it comes to pruning, so be sure to do your research before you begin. Roses: Climbing roses should be pruned right before the leaf buds break, or after you remove winter protection. Flowering Trees: Prune fruit trees that flower in the summer, such as Crape Myrtles and Rose of Sharon. How do I prune a plant or tree? Always have a clear purpose in mind when you prune your plants or trees. How you prune a plant now will affect how the plant looks and grows for the rest of the year. Prune in a natural style, and work with the natural shape of the plant. Don’t shear or top tall shrubs, and don’t remove low-lying branches from low-branching trees. You ultimately want to highlight the plant’s natural features, and if you do a good job of pruning, it will look like you have done nothing at all. Start by removing undesirable deadwood and diseased branches, then remove branches that cross or rub on one another. Do this by starting with the larger branches and moving to the smallest. Next, trim the canopy. Start at the center and move to the exterior thin branches that make up the bulk of the tree or shrub. Never remove more than ¼ of the foliage, as doing so will severely impact the health of the plant. Lastly, know when to call in the experts. Our team at Greener Horizon are experts in landscape management and can help you care for the grounds at your home or apartment complex. Visit our website to enquire about our services, or visit or blog for more helpful lawn care tips.